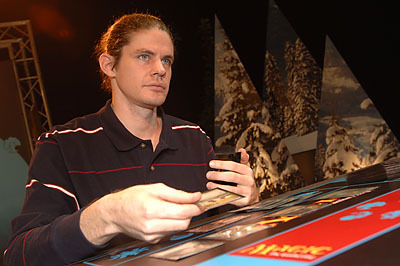 My personal favorite bluffing story involves none other than Mike Hron, winner of last weekend's Pro Tour in Geneva. 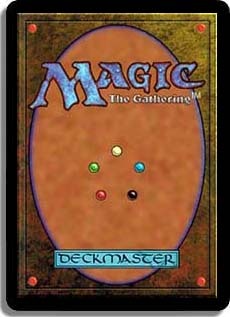 On the Saturday night of Pro Tour - Tokyo 2001, I and my former Car Acrobatic teammates Andrew Cuneo and Andrew Johnson were involved in a 3-on-3 Invasion-Invasion-Planeshift side draft against Hron, Bob Maher, and a third member of their Madison posse whose name doesn't immediately spring to mind. Cuneo was playing Hron, and both had green-based decks. Hron played one of Invasion's many 2/2s - a Nomadic Elf or a Yavimaya Barbarian - on his second turn, and Cuneo answered with a 2/3 Pincer Spider on his third turn. On Hron's third turn, he played a land and then attacked with his 2/2. He was representing a trick, and was positive Cuneo wouldn't risk his Spider by blocking. Cuneo blocked. Hron's bluff was called, and the 2/2 died. "No one blocks there," he said, stunned. The environment was so full of Giant Growth effects - most notably the cantrip Aggressive Urge - that it was almost written in stone that blocking while you were tapped out against a green player was usually not worth it. Hron had probably run that same play time and again against players of all skill levels, sneaking in untold numbers of free two-point hits. But Cuneo did block, rationalizing that if Hron had to use his mana on a trick to kill the Spider, then at least he wasn't playing another creature. Bluffing is fantastic when it works but can be absolutely devastating when it doesn't, especially if the game isn't out of hand one way or the other when you do it. Personally, I'm a bad bluffer, mainly because I'm a bad liar. I either have to be totally at ease with my opponent to be able to pull something off, or in such a tense match that being flushed or flustered wouldn't seem out of the ordinary. Let's just say I'm no threat at the poker table. Mark Rosewater led you all to believe he was writing on topic this week with his Bunyan-esque tall tales, but I'm going to give you what he said he could not - stories about making cards with bluffing mechanics built in. Let's start with the most obvious one. 2, T: Name a card. Target opponent chooses a card at random from your hand. If he or she chooses the card you named, Joy Buzzer deals 2 damage to target creature or player. The Tempest design team (Mike Elliott, Richard Garfield, Charlie Catino, and I) went to Portland and spent a week huddled up in a borrowed house. We were working so hard that we felt we deserved to take one night off to see a movie. (We saw The Frighteners, for those of you who like obscure trivia.) Walking to the theater, Richard came up with this card. The idea behind it was that it was a bluffing card. For example, a player might name a card, like Counterspell, that wasn't even in his or her hand. Development liked the card, but felt it wasn't good enough to actually play, so we juggled the numbers around to create Cursed Scroll. Oops. The problem with Cursed Scroll as a bluffing card is that Richard's initial vision is not how the card is played. The upside of dealing two damage when the named card is revealed is so high compared to any small amount of misinformation you might be able to dole out to your opponent by naming a card not in your hand that everyone simply tries to empty their hands and not bluff at all with the card. I'm not saying there aren't opportunities to bluff with the card. For example, if I have one card in hand and activate the Scroll targeting your Spike Feeder and naming "Ball Lightning," you will most likely sacrifice the Feeder for four life and then play the rest of the game believing I'm holding a Ball Lightning, when in actuality I have a Mountain in hand that I didn't have to show you because the Scroll activation "fizzled" when you sacrificed the Feeder. Granted, if I use the Scroll more in the next few turns, you will probably be able to deduce that I don't actually have a Ball Lightning. Or, I could do it Richard's way, activating the Scroll over and over with a handful of cards, repeatedly naming Honorable Passage even though it isn't in my hand, hoping the threat of it is keeping you from playing burn spells. But come on, that's not how Cursed Scroll is used. 2, T: Name a card. An opponent chooses true or false. If the opponent chose true and the named card is not in your hand, or if the opponent chose false and the card is in your hand, you may reveal your hand and draw a card. As far as bluffing cards go, Liar's Pendulum was a huge leap forward compared to Cursed Scroll. The Pendulum rewarded you for bluffing directly, as opposed to the Scroll's theoretical potential indirect reward. And the Pendulum's reward for bluffing correctly gave you more fodder for later bluffs. What impressed me the most about the card was that there were players that were just "better" at it than other players, even in playtesting. Pat Chapin, the development intern during the months we were working on Mirrodin, was particularly adept with the card. He'd draw card after card with the Pendulum, fooling others - myself included - time and time again, while constantly guessing correctly when it was on the opposite side of the table. Reading - and fooling - people were skills Chapin carefully honed. I remember being at one of Rosewater's Christmas parties when Pat pulled out a deck of regular playing cards, gave me half, and said, "Let's play Bluffing Book." Even without the context of a game of Magic to help guide our guesses, Pat out-drew me by about three to one. The Randy Buehler-led Mirrodin development team tried pushing the activation of Liar's Pendulum down to 1 so that it might see more constructed play. But they later recanted, with Randy stating in Multiverse: "2 base and 1 to activate seemed good, but team is worried that people will get tired of this card if we push it that hard. Backing off to 1 base and 2 to activate after much debate (and over some protests)." Like Garfield before him, Brian Tinsman created this cycle with the hopes that they would provide ample opportunities for bluffing during game play. They were even called "Bluffers" in playtesting, and their actual name - "Deceivers" - plays into the bluffing motif as well. But, just as before, most players figured out that the best way to play them was the "safe" way, with no bluffing involved. The most mana-efficient use of these cards was to pay 1 to check the top card of your library for land at the end of your opponent's turn, then if land was there, pay 2 during your own upkeep to activate the big ability just before you drew the land in question. Tinsman openly lamented around the office that "Spike" figured out how to take all the fun out of his cards. To his credit, though, there were plenty of times where checking for land and then attacking without revealing was a good play - the perfect bluff scenario. Perhaps my favorites of all the cards I'm discussing in this article, this pair enables bluffing without having to spell out anything to complicated or out of the ordinary. With cards in hand, the opponent can never be sure how many times you can pump these creatures - unlike, say, Wild Mongrel, whose ability is based on public information (number of cards in your hand) rather than hidden information (number of a certain kind of card in your hand). Attacking, blocking, and using toughness-based removal against these creatures is always a risky proposition, and as their controller, you can make gutsy attacks that might not always work out in your favor - if you can keep a straight face. I enjoyed these cards so much that I made Fleshgrafter for Fifth Dawn and Simian Brawlers for Coldsnap, both of which use the same mechanic of discarding cards of a certain type. I'm surprised we don't return to this well more often. A similar card, Lightning Storm, was made by Richard Garfield and was tossed from set to set for a long time before finally being put into Coldsnap. Sadly, like most other "subgame" cards, the sheer amount of text required to explain what is going on really detracts from the card as a whole. The big one. Richard really dipped his toe into a vast sea of untapped potential when he made Illusionary Mask for the game's first release. Against uninformed opponents, the Mask just creates a chaotic, confusing game state where no creature is different from any other and decisions on how to handle them are often made seemingly at random. But as the opponent gets more savvy, more used to the contents of the Mask player's deck, he can start recognizing tells about which creature is currently in play, what measures are being taken to protect it, etc., and can start to form educated guesses about what's going on. And as soon as the opponent starts trying to deduce things based on the Mask player's tells, the Mask player is given the opportunity to bluff, by acting as if one creature was really another or playing the creatures out in a different order than ususal. Because the face-down Mask creatures are 0/1, have the low end of their mana costs marked on them with counters, and can be turned over for free, the onus placed on the opponent of the Mask player is not the same as that placed on someone playing against morph creatures. All morphs start out the same, as 3-mana 2/2s. They all cost different amounts to flip up, and all turn into different things. It is definitely in the opponent's best interest to try to deduce what the morphs are, and therefore in the best interest of the morph player to try to mislead. When Onslaught came out, that scenario worked really well in Limited - check out this great old article by our own Paul Sottosanti on bluffing and morph in Onslaught Limited. In Constructed play, however, too few of the morph creatures were actually good enough to see play in an age of Lightning Rift, super-fast Goblin decks, and Smother. If a white deck played a guy face down, it was almost certainly an Exalted Angel. If a red deck did, it was Blistering Firecat. That was about it. With Time Spiral, we put most of the morph creatures in a single color - blue - and made several of them good enough to see tournament play. The result is a morph deck - some call it "Pickles" - that actually plays a wide enough variety of morph creatures for guessing and bluffing to factor into games. For additional reading, check out Mark's article Wait, There's Morph (September 2002) about the evolution of the morph mechanic as it appeared in Onslaught. Are there more cards in Magic that encourage or reward bluffing? Certainly. There are goofy subgame cards like Goblin Game and Menacing Ogre that use hidden information that isn't just what's in your hand or on top of your library, but rather "secret numbers" that turn into bites out of your life total. There are divvy cards like Fact or Fiction and Gifts Ungiven that reward you for making your opponent think certain things about your hand and the game state are true. But think about that last example… the bluffing comes from trying to mislead your opponent about the contents of your hand. The truth is, most games of Magic revolve around such bluffs, regardless of whether we make cards that reward it or not. Remember my previous example with Hron and Cuneo? A 2/2, a 2/3, and the threat of a combat trick - Magic at its most simple, yet still oh-so-interesting: full of possibilities to outthink, outguess, and outplay one another. I'm sure we'll still dabble in the occasional bluff-enabling card, but the truth is we hardly need to. I've been asked to advise you that our servers will be down for power maintenance from 12 a.m. PST to 1 p.m. PST this coming Sunday, February 18. The site should come back up soon after that, but the message boards may remain down for much of the day. Between this column and Paul Sottosanti's feature article The Color Purple, there are a whopping five outstanding polls to be addressed. Here we go. First, Paul asked in his feature if a sixth color should be added to the game. Wow, those answers are all over the map. While it doesn't surprise me that "no" got the most votes, I am a bit taken aback that over half of you wouldn't object to a new color permanently as long at it did something unique. I would be surprised if that ever happened unless we suddenly found some massive area of simple design space that we'd somehow neglected to use for 15 years. Trust me, it's hard enough coming up with enough stuff for five color block after block. My own answer would be "temporarily," which is what we were attempting to try in Planar Chaos. I could imagine a block with six colors, where some number of the block mechanics lived only in purple, giving it its own feel, but nothing so deep as to be sustainable. I asked the next question: How do you feel about the Planar Chaos "timeshifted" card frames? Wow. Almost all of you like them, with almost half of you liking them more than the frames we're currently using. From perusing my inbox, the feeling I get is that most of you aren't fans of the white card text (chosen, honestly, to make them stand out from other cards more than because it looked the best), but really like the saturation and textures of the text boxes. I'll certainly pass these results on to Jeremy Jarvis. The next question posed was: Which of the following timeshifted cards would you most like to have seen printed? There's no right answer here, but some of the numbers are of interest. Namely, white Memory Lapse, the card Mark Rosewater pitched to Bill Rose initially, scored the highest. Mark certainly chooses his examples carefully. Second, blue Preacher, the card we most agonized over cutting at the end, scored poorly, so I guess it was no great loss. Were I to vote, I'd choose black Serendib Efreet… Oh, how I love efficient creatures! Devin Low asked the next question: Which of the following off-beat Planar Chaos rares do you like best? The loser doesn't surprise me; time and again I've seen message board posts that claim Spellshift to be the worst card in the set. The winner doesn't surprise me, either. Wild Pair is an awesome card with a tremendous upside that is loads of fun to build and play with. What does surprise me are numbers 2 and 3. I had some worries that the new Braids, while a nice mirror of the original, was too fragile and symmetrical to catch anyone's fancy. Glad those fears were unfounded. Similarly, I'm happy to see that Heroes Remembered - which is "just" a lifegain spell - tickles people as well. I guess you can't go wrong with the combo of lifegain and big numbers. The final question, again from Devin, was: How do you like Serra Sphinx? The leading vote getter basically equates to "meh," or 2 stars out of 4. But the number of "Like it" + "Love it" far outweighs the number of "Hate it," meaning the card went over positively, if not overwhelmingly so. There was a lot of internal debate over whether old Serra Angel had any cache left after 15 years. Looks like she did!